In 1957, French sociologist Paul-Henry Chombart de Lauwe made a map of Paris: “Trajects pendant un an d’une jeune fille du XVIe arrondissement”. It’s an idiosyncratic map, based on the movements of a single individual, a young woman studying at the school of political science. A triangle emerges from her movements – the vertices are her residence, the university and the home of her piano teacher. Such maps are becoming routine these days – we generate them involuntarily, as the cellphones most of us carry with us leak this locative data, at minimum to our telephone carriers, if not to other audiences. If we engage in certain kinds of online behavior – checking in via Foursquare, posting to Twitter with geolocation – we may be generating maps visible to the general public. 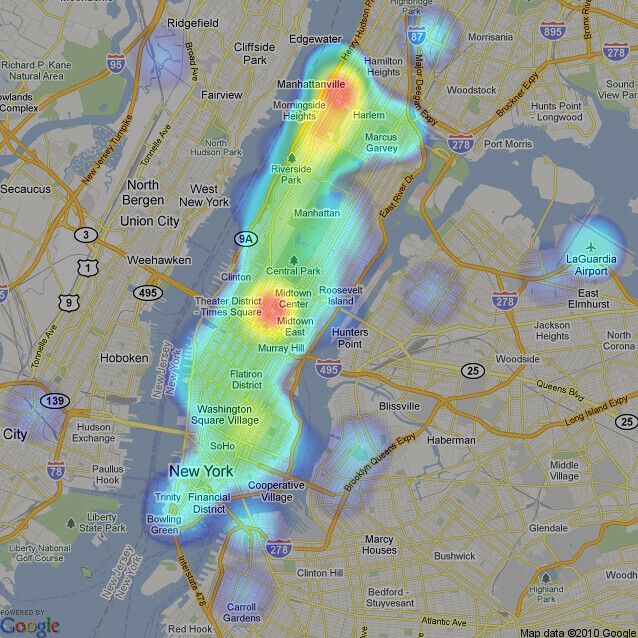 Zachary Seward’s map of New York City, via his Foursquare check-ins. From his article on the WSJ’s blog site. Debord’s observation applies to individuals beyond this one student – as de Lauwe observed of his map, it illustrates “the narrowness of the real Paris in which each individual lives.” While she didn’t stray far beyond the 16th Arrondisment, and Seward’s Manhattan is concentrated heavily around the Upper West Side, we all frequent a tiny subset of the physical world that’s open and available to us. We might be outraged at the narrowness of the worlds we end up inhabiting, or we might accept that all of Paris or New York is simply too large for one human to inhabit and interact with, without selecting a comfortable and familiar subset to choose to explore in depth. Like Seward, we could start to analyze the maps we generate and find ways to question or change our behavior. Or we could try to address this phenomenon of world-narrowing head on and tackle it as a challenge to be solved. In 2005, Sam Lavigne, Ian Kizu-Blair and Sean Mahan moved from Chicago to San Francisco, and started building an alternate reality game designed to encourage players to discover things they’d never seen or done in the city, in a way that encouraged independence and exploration. Their game, SF0, invites you to score points by carrying out tasks, many of which are surreal, silly or surprising. You score by documenting your “praxis” and posting photos, videos and other evidence of the intervention. At the moment, players can score points by giving a pig a pancake, convincing complete strangers to invite them into their home for dinner, reverse shoplifting (placing items in a store so that they may be purchased), challenging random people to contests of strength or inserting information into a place that lacks it, or through dozens of other tasks. Sign up as a new member and you’ll discover that the tasks open to you are the easiest to complete – others require you to “level up” and demonstrate your competence as a operative before you can take them on. And you can marvel at some of the completed projects, like Britt++’s conversion of a bus stop into a nightclub chill-out room, or babe’s book about eating books made from pasta. There’s a loose, conspiratorial narrative that provides a bit of organizing framework for the tasks – those sponsored by the BART Psychogeographical Association focus on the way people move through places (especially San Francisco), while those from the Society for Nihilistic and Disruptive Efforts focus on “administering a wedgie to the world”. Administer sufficiently inventive social wedgies and you’ll advance in rank and be able to undertake larger tasks. What’s fascinating to me is that the game seems to work quite well, despite being almost solely player-generated. The tasks are created by players for others to complete, and despite a very broad definition of what might be allowable as a task, there are clear, deeper themes that emerge from reading some of the tasks. Most are efforts to make the world a surprising and wonderful place, to encourage people to go places they wouldn’t normally wander and to speak to people they’d generally ignore, to question societal conventions and the force of habit in a way that’s playful and provocative, though not confrontational. Hints abound that the game’s creators are fans of Debord specifically, and of Situationism in general, though it’s not clear that everyone playing is up on their 1960s French Marxists. And SF0 seems far less likely to lead to a series of factory strikes in the Bay Area than it is to encourage people towards random acts of kindness. But McGonigal’s point is less general, and more focused on the special nature of games. The best games stimulate our problem-solving instincts, encourage our creativity in trying novel and unusual solutions, and intensely capture our attention and focus. If we build games that encourage us to solve real problems as well the ones game designers concoct to challenge us, perhaps we can harness that focus, energy and creativity. Her games have included World Without Oil, designed to help players discover solutions to the social unrest and disruption likely to arise in a world of $7/gallon gasoline (for my non-US readers, yes, the idea of petrol at $1.80 per liter is sufficiently provocative to get Americans to think about social transformation), and Urgent Evoke, built with the World Bank and designed to train a generation of social entrepreneurs around the world, with a focus on the developing world. I participated in Urgent Evoke, first as a player, and later as a “mentor” to other players – while it was a fascinating experience, it felt at least as much like a brainstorming and training session than it did like a traditional “game”. I think the challenge for McGonigal is the same for anyone exploring “serious games” – how do you ensure they’re serious while ensuring they’ve got some of the joy and excitement that comes from traditional, entertainment-first games? My guess is that one way to solve that problem comes from building games that are open enough to generate multiple forms of gameplay. For the past year, I’ve been fascinated by geocaching, seeing it as an invitation to stray from the de Lauwean paths we all tread and explore in detail the places we mindlessly pass through. But that’s not the way everyone plays the game. One group of cachers uses their “hides” as a set of local history lessons – searching for a cache near my home led me through three of the historical sites in New Ashford, MA. Others use the framework of the game as a way of trading collectible tokens and exchanging small gifts with people around the world. The idea behind the game – hide something in the real world and publish GIS coordinates so others can find it – is broad enough that you can play your way and I can play mine, and neither of us is wrong. The flip side, of course, is that a game that’s too open doesn’t feel sufficiently gamelike. I’ve been fascinated with The Nethernet (formerly PMOG), a web-based game that you play through following links between webpages. I wrote about the site some years back, noting that the idea of “playing the Internet” seems like a great way to encourage people to stumble into unfamiliar corners of the web. Unfortunately, the project seems to have lost its backing, and I stopped playing a long time ago, both because it didn’t work well for me as a game or as a serendipity engine. The problem I’m most interested in solving is similar to the one The Nethernet promised to help with and which SF0 seems to address: I want to help people discover the intellectual and informational ruts we all fall into, and find creative ways to crawl out of those ruts. I’m increasingly convinced that it’s little use to simply make people feel bad or guilty that we don’t pay enough attention to the political crisis in Ivory Coast or prison conditions in the US. We all need help stumbling on the information we didn’t know we needed and hadn’t realized we were missing. McGonigal is right – there’s something powerful about games that might be able to be harnessed to help us broaden our worlds. If SF0 can help – slowly, strangely, randomly – heal and transform a city, how might we build games that encourage us to wander through a broader world? I’ve been thinking a lot about this too. People respond to incentive, and those incentives are currently use human behavior to get people to buy things or consume more content. Very few products out there try to change different types of behavior. What if Americans got “points” in some massive multiplayer game that rewarded them for exploring the world beyond our shores? What if those points could then be redeemed for rewards (social or otherwise) that reinforced that behavior. From a pseudo-phycology standpoint, Games are a largely an elaborate form of positive reinforcement. They also abstract and simplify real-world concepts in ways that assist learning. To me and others, like my colleague Patrick Meier, the value of the Ushahidi platform for most of the people in crisis, is usually simply to ‘see their dot’ on the map. In other words, they want to ‘score’. This red-dot representes me, what I did, where I did, what my feelings were and only thereafter do many consider the implications of whether or not participating has changed their life for the better or for the worse. Jon, that’s a really important insight on Ushahidi – the importance of seeing your feelings, your expression, your experience acknowledged online. I think it’s important that, in all these games, you’re leaving your mark on the world, both online and, in some of the more clever cases, in the “real world” as well. Thanks for commenting. Most are efforts to make the world a surprising and wonderful place, to encourage people to go places they wouldn’t normally wander and to speak to people they’d generally ignore, to question societal conventions and the force of habit in a way that’s playful and provocative, though not confrontational. Hints abound that the game’s creators are fans of Debord specifically, and of Situationism in general, though it’s not clear that everyone playing is up on their 1960s French Marxists. And SF0 seems far less likely to lead to a series of factory strikes in the Bay Area than it is to encourage people towards random acts of kindness. What they’re doing is what I’m after as well. How do we “mix things up,” get people out of their “normal” situations, and let them think freshly about their lives, world, relationships, etc? How do we get people to laugh, connect, play, share, experience delight in each other and the world around them? This is worldchanging stuff. SFO brought to mind Improv Everywhere ( http://improveverywhere.com ). Improv Everywhere is one of my favorite examples of people actively creating and engaging in the kind of interactions that wake people up, cause them to smile, and create a shared sense of community. It’s hard to watch their stuff and *not* want to get involved, be creative, and act with kindness toward random strangers. *Fun riff on GhostBusters filmed at The New York Public Library at 42 Street. Thanks again, Ethan. I’ll be chewing on this for a while. Ethan, I did some research this summer on Jane M. and was fascinated with her vision of how this type of world could come to be. As a high school biology teacher, I find myself far to often discussing video games with kids. They play these things a lot and talk about them even more! A link I thought that may be of interest is http://playinterrobang.com/. I’ve yet to try it in my own teaching but can see the potential. Frequent reader, first time commenter, great stuff! NEW PLAYER: Oh, what’s this? A game? Capital! Let’s see, Information Insertion. “Insert information in a place that has an absence of information.” What do you mean, like outside? Highly suspect, old thing! I’m sure that player is in a minority, but we do get a lot of new sign-ups who, for various reasons, never complete any tasks. For more games by the creators see http://paragoogle.com/. They are also listed on the staff of Nuvana, who created Interrobang. Way to keep busy, guys.